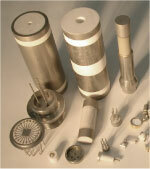 Hermetic Seals | IJ Research, Inc.
IJ Research is a hermetic (vacuum tight) sealing company. We routinely check the hermeticity up to 10-11 He std. cc/sec at 1 atm pressure differential. In order to maintain a high level of hermeticity, IJ Research controls the thermo-mechanical and/or thermo-chemical behavior of the materials during the processing of GTM sealing, CTM sealing or any other processing. When/if a sealing material experiences a microstructural phase change, IJ Research controls nucleation and crystallization parameters as required. We guarantee the final seal to attain the proper ratio of vitreous and devitrified phases in the sealing system and a permissible amount of residual thermal stress. When/if a particular sealing material experiences an oxidation/reduction process, IJ Research controls all parameters of the process to ensure the final seal attains the maximum interfacial adhesion strength. The adhesion strength IJ Research provides is typically far greater than the customers’ requirements. This design factor is one of the reasons why IJ Research products are rarely rejected by customers. As we have demonstrated in many projects using next to impossible combinations of materials and processes, we are able to take care of your needs for seals, bonds and joints for virtually any application. One example of our specialties is a hermetic seal of 300 series SST to Corning 7740 (Pyrex) for an application temperature range from -300°C to +300°C. This is just one of the challenging examples that we have successfully completed over the years. Virtually all the parts IJ Research manufactures are hermetic and its applications are endless from missile guidance, thermal imaging, radar, satellite, catalytic converter, radiator, detonator, pressure transducer, etc. We specialize in sapphire to metal seals and every day seal sapphire to a wide variety of metals for the medical, oil/gas and defense industries. 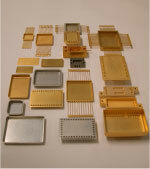 See Sapphire to Metal Seal section for more detail. For more information, please see the PDF brochures: Hermetic Seal, Metallization, Ceramic to Metal Seal, Sealing Glass List.